Microsoft is due to shine the spotlight on Windows 10 at its Redmond campus on January 21, and now the company has set a time for you to tune in. 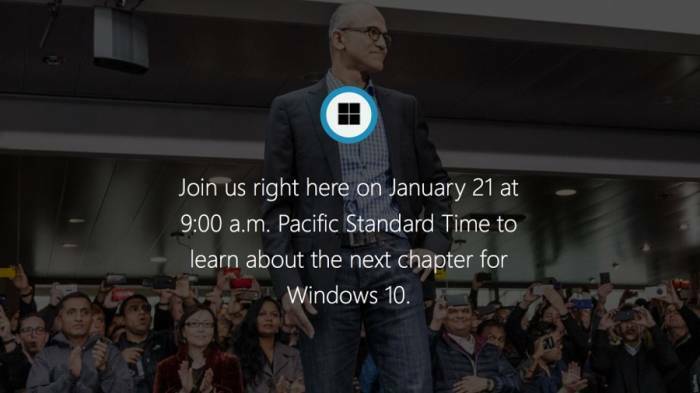 The event will be livestreamed on Microsoft’s dedicated Windows 10 story website from 9am (Pacific) / 5pm (GMT). Don’t worry if you miss it: an on-demand version will be available to view on the same page straight after. For Time Zone Conversions for the Webcast Visit Here. Next Next post: Face a Ban! – Using WhatsApp Plus? BBM Beta now available for Windows Phone. Leave a comment on BBM Beta now available for Windows Phone.